Publisher: Nakladatelství LEDA spol.s r.o. 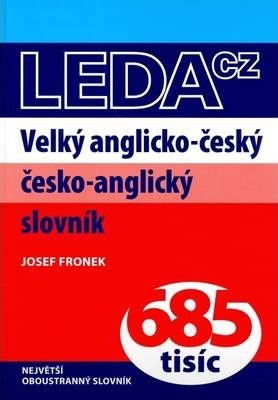 This book is the largest currently available bidirectional Czech-English dictionary in a single volume. It can be used by English-speaking learners of Czech and Czech-speaking learners of English. The dictionary contains over 120,000 entries in both parts, more than 200,000 words and phrases and approximately 400,000 equivalents. The focus is on contemporary vocabulary of Czech and English. Due to its scope, Comprehensive English-Czech and Czech-English Dictionary will appeal to a broad group of users. It is suitable for students and teachers, translators, interpreters and other professionals. In the Common European Framework of Reference for Languages, this dictionary covers the levels from A1 (Basic user) to C2 (Mastery or proficiency). Nakladatelství LEDA specializes in dictionaries and language books and belongs to the leading publishers in this field in the Czech market.